Football huh: don'tcha hate it? Bloody Bournemouth and Bloody Man United had both lost in the day's earlier games sending Saints back into the relegation zone. If that was not enough bad news, Liverpool turned up in their lurid orange strip in which they have never been beaten. FFS! Sky covered this one. Studio pundits Henry & Souness and the commentary was by Tyler and Smith. Saints kicked off towards the Northam but Liverpool won the ball with Arnold finding Salah. Think it was Stephens who put the ball out for a corner which Saints cleared. Liverpool continued to attack and Saints looked brittle at the back. Hoedt looked lucky to get away with upending Firmino. Then good pressing by Højbjerg caused Robertson to concede a corner. Bertie's cross was cleared and, when the ball was dinked back in, Virgil calmly headed it back to his keeper to a loud chorus of boos. Saints won a free kick which Liverpool cleared and then Oxo drew a save from McCarthy. Saints were now seeing more of the ball without unnecessarily troubling the Scousers. They cleared another Bertie cross before catching Carrillo offside. Then some sterling work in midfield by Lamina enabled Saints to get forward but Stephens' put his shot wide. Moments later Tadić was flagged offside. Karius rose to punch Lamina's cross and was thankful it dropped to a defender. The on 17m a perfect chip by Romeu eluded Robertson allowing PEH to force a save from Karius. More Saints pressure tested Liverpool's back line before they mounted another breakaway. Hoedt hacked the ball clear and, thankfully, it bounced off Firmino for a goal kick. Saints were competing now and Liverpool were working hard to keep us at bay. On their next foray forward an outlandish dive by Firmino was ignored by the officials. Robertson recovered the ball, fed Mane but the Senegalese shot wide. On 27m Tadić got forward for Saints but the defenders cleared the danger. Two minutes later, JWP sent in a beautiful cross. Carrillo rose above Arnold, but put his header right into Karius' gloves. Either side and we'd have been level. Then JWP was the beneficiary of another fine cross, this time from Tadić on the left. Sadly, he didn't head it down and Karius was able to tip the ball over. Nothing came from the resulting corner as Romeu had fouled a defender. On 32m Lamina was clattered by Oxo and from that point onwards seemed to move more gingerly. Liverpool got forward with Winjaldum finding Mané. Under pressure from Cedric his shot again missed our goal. Liverpool's next attack saw Robertson cut in from the left and drive a low cross into our box. It avoided all-comers exiting the area on the other side and allowing Saints to clear. Tadić and Bertie then got down our left but Matic cleared. Tadić tried again, this time winning a corner off Arnold. The cross was headed out as far as Lemina who lobbed the ball back into their box – catching 3 of ours offside! Tadić's persistence got Matip carded when the Cameroon international dragged the Serb down (egg-chasing style!) JWP's free kick sailed straight into the keeper's gloves. Liverpool got forward but Robertson's cross was grabbed by McCarthy. At the other end, Tadić and sent Bertie down the left but his miscued cross sailed harmlessly into the Northam. On 41m, a sweet Saints move again got Bertie into a crossing position. This time his lovely ball reached JWP but, again, our #16 was unable to beat Karius. A minute later Liverpool extended their lead. Saints sat too deep, allowing Matip to carry the ball well over the halfway line. With no-one closing down, he was able to find Salah with his forward pass. Salah played a sweet one-two with Firmino – whose outrageous backheel split Saints open. Salah collected the ball and slotted it beyond McCarthy's dive. Nearly half-time and 0-2: oh bugger! My annoyance was slightly tempered by having both Salah and Firmino in my Fantasy Team but I was unable to think what MoPe might do to redress the balance. HT = 0-2 and my notes say "Great game – shame about the score!" The half was moments old when Can was booked for a foul on Romeu. The free kick was wasted. Soon after, Lemina needed treatment and the commentary team suggested he was ill. He stayed on for the time being and did well to thwart Liverpool's next attack. Firmino got a cross in from their left which Mané met with a flying volley. Lemina blocked his effort, the ball dropping to Salah. Fortunately, the Egyptian shot wide. Lemina was eventually withdrawn on 52m. PEH dropped back alongside Romeu, Tadić moved inside and substitute Boufal went wide left. Saints attacked down that flank, winning a free kick for Arnold's foul on Tadić. JWP's cross was met at the near post by Hoedt, but his header went the wrong side of the post. On 60m Milner replaced Oxo and took the armband from Can. Arnold then sought Salah but Hoedt won the ball and brought it clear. On 62m Romeu was carded for a foul on Milner. Liverpool worked the ball to Winjaldum but the Dutchman shot wide. Then, a promising Saints move was ended by Virgil's glorious interception before JWP could latch onto a through-ball. At the other end, Liverpool worked an opening for Can but he fired wide. With Shane Long warming up, Mané played in Firmino. McCarthy blocked his shot, the rebound falling to Salah whose shot missed the target. Long was on for JWP on 71m with Saints going with two up top. Both broke into the box moments later, only for Cédric to put his cross into the crowd. When their next attack broke down, Saints were back-peddling once more. Mané cut inside, but Stephens blocked his shot so Saints could clear. They quickly recovered the ball, but Stephens was again on hand – this time he calmly headed back to the gloves of McCarthy. Liverpool were beginning to dominate possession and Firmino found Mané but, yet again, the once-lethal finisher scuffed his shot wide. On 75m Virgil carried the ball into our half. It looked, for all the world, like he fancied a long-range pot at goal. Fortunately, Cédric was on hand to see him off. Lallana replaced Firmino on 79m and shortly afterwards Romeu came off for Steve Davis. Noticeably, Bertie didn't hand over the armband. Lallana's first significant involvement saw him cut out and clear a Tadić cross. Then, on 83m, the Saints fans began singing and drowned out the Scousers. It made a pleasant change from the tirade of boos that had followed Van Dijk's every move. On 85m Salah played in Lallana but he too failed to work McCarthy. 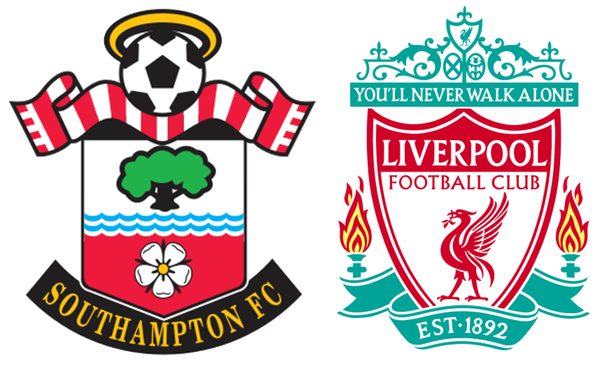 Although Liverpool had not added to their lead, Saints had failed to replicate both the possession and chances they'd created in the first half. As time ran down, the away side seemed content to keep the ball. Then, on 89m, they brought on Lovren for Salah. During the 4 added minutes, our players looked tired out. Fortunately, Liverpool were not inclined to further damage our goal difference and time ran out with no change to the half-time score = 0-2. It was good to see warm handshakes between both sets of players and especially the former Saints. Virgil gave Jack Stevens a long hug – Jack being the main beneficiary of his transfer to Liverpool. Virgil went off to compete in the Champions League: Jack to try and keep Saints in the top flight. Others went for obvious choices: Firmino or Salah who combined to score both the goals. However, given the occasion, the hostility of our fans and his near faultless display, my choice for the game's best player is Virgil Van Dijk.